Crypt keeper wasps appear to command crypt gall wasps to dig exit tunnels on their behalf. The crypt-keeper wasp, Euderus setRYAN RIDENBAUGH AND MILES ZHANG/UNIVERSITY OF CENTRAL FLORIDACrypt gall wasps (Bassettia pallida) lay their eggs in the branches of oak trees, where wasp larvae develop within compartments called crypts and the wasps eventually chew their way out as adults. 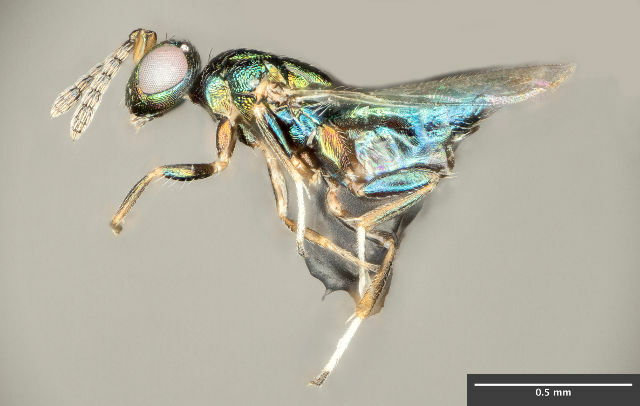 But Scott Egan and Kelly Weinersmith of Rice University found that another wasp—a new species, much smaller than the crypt gall wasps and a beautiful iridescent blue—often occupy the crypts with the B. pallida larvae. 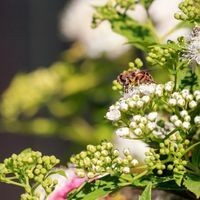 Upon further investigation, the researchers learned that the small, blue wasp somehow commands the crypt gall wasp to dig a smaller–than-usual tunnel out of the oak branch. When the larger insect tries to escape, it gets stuck, plugging the hole with its head. The smaller wasp then eats the crypt gall wasp alive and ultimately exits through the hole. The researchers describe the new species, which they dubbed the crypt keeper wasp (Euderus set), in ZooKeys earlier this month (January 12), and published the details of their bizarre relationship with the crypt gall wasp in the Proceedings of the Royal Society B yesterday (January 24). While it remains unclear how E. set wasps manipulate their crypt mates, the study suggests that it is to their benefit: crypt keeper wasps that didn’t bunk with crypt gall wasps—and thus had to tunnel their own way out of the tree—were nearly three times more likely never to make it out alive. 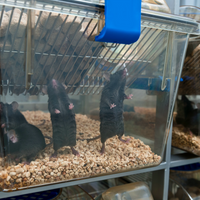 See “Animal Mind Control,” The Scientist, January 2012.